On Wednesday night June 20th, one of my worst nightmares came true. By an accident in the kitchen with a very sharp knife I cut myself very deeply in three fingers on my right hand. I severed both tendons, a nerve and partially the artery in my right ring finger and at least a tendon in my little and middle finger. I saw a hand specialist in Seattle yesterday and there’s a relatively small chance that I will fully regain my fine motor skills in my right hand. Everyone who has seen or heard me play knows that my songs and my way of playing guitar is based on finger picking and then there’s also the piano. My heart is broken. The guitar and music is such a big joy in my life and I provide for my family with the music. I have to go through a big surgery on my hand in Seattle on Tuesday and after that a long period of rehabilitation. Hopefully I can find a way to play my songs again; I will do everything I possibly can and I choose to believe in a miracle. The accident was indirectly caused by a verbal and nearly physical attack from a neighbor earlier that evening. I would rather not go into detail here, but I was deeply shocked and scared senseless and it was while Janna and I were talking about this event that I got distracted and in anger cut way too hard through a hotdog that I was holding in my right hand. I cannot explain why I was cutting with my left hand when I’m right-handed; I was still in shock. I need your help. I have health insurance which will hopefully cover the cost of surgery and the ambulance to the emergency room and the emergency room stay Wednesday night and Thursday morning, but there’s a big chance I’m going to have to pay for the cost of rehabilitation and physical therapy. Aside from that I have to cancel many already planned shows this summer and fall, including a tour that Janna booked and that we were going to embark on next week with our boys. I may also have to postpone the release of my new album. I need peace and time to heal and I cannot perform and earn money for a yet to be determined length of time. Janna now has the additional burden of caring for me and taking on more household tasks. Your donation will help sustain our family for the next few months of recovery, as well as cover the cost of physical therapy, which my surgeon explained is absolutely crucial to healing and regaining the use of my hand. Thank you for whatever way you can help. I am very grateful for your support. Onsdag aften d. 20. juni blev et af mine vœrste mareridt til virkelighed. Ved et uheld i køkkenet med en meget skarp kniv skar jeg mig selv meget dybt i tre fingre på min højre hånd. Jeg har skåret begge ledbånd, nerve og delvist blodåren over i min ringfinger, samt mindst et ledbånd i min lillefinger. Jeg var hos en håndspecialist i Seattle igår og der er relativt lille chance for at jeg fuldt ud genvinder min finmotorik i højre hånd. Alle der har set eller hørt mig spille ved at mine sange og min måde at spille guitar er baseret på fingerspil og så er der selvfølgelig også klaver. Mit hjerte er knust. Guitaren og musik er så stor en glœde i mit liv og jeg forsørger min familie med musikken. Jeg skal igennem en stor operation i hånden i Seattle på tirsdag og derefter en lang periode med genoptrœning, hvor jeg forhåbentlig kan finde en måde at spille mine sange igen; jeg vil gøre alt hvad jeg overhovedet kan og jeg vœlger at tro på et mirakel. Uheldet var indirekte forårsaget af et verbalt og nœsten fysisk angreb fra min nabo, som jeg helst ikke vil beskrive i detaljer, men det var mens Janna og jeg talte om denne hœndelse, at jeg distraheret i vrede skar alt for hårdt igennem en hotdog som jeg holdt i højre hånd. Jeg kan ikke forklare hvorfor jeg skar med venstre hånd når jeg er højrehåndet; jeg var stadig i chok. Jeg har brug for Jeres hjœlp. Jeg har sundhedsforsikring, som forhåbentlig vil dœkke operationen og ambulancekørslen og opholdet på skadestuen onsdag aften/torsdag morgen; der er dog stor chance for at jeg kommer til at kœmpe om omkostningerne for genoptrœning. Derudover er der stor chance for at jeg må jeg aflyse mange allerede planlagte koncerter denne sommer inklusiv en turne Janna har booket for os og jeg måsandsynligvis udskyde udgivelsen af min nye plade. Jeg har brug for fred til at hele og jeg kan ikke optrœde og tjene penge i en endnu uvis periode. Janna skal nu bœre den ekstra byrde det bliver at hjœlpe mig og tage sig af børnene og husholdningen. Jeres hjœlp vil holde min familie ovenvande de nœste måneder mns jeg heles og også bidrage til omkostningerne for genoptrœning, hvilket min kirurg siger bliver meget vigtigt for min hånds rehabilitering. I know it's been a very long time since we've written an update. Life has been full and very busy! Thanks to all of you for your caring, and patience. I'm also sorry to have taken so long to write this, especially since the previous update was laden with distress and challenges. 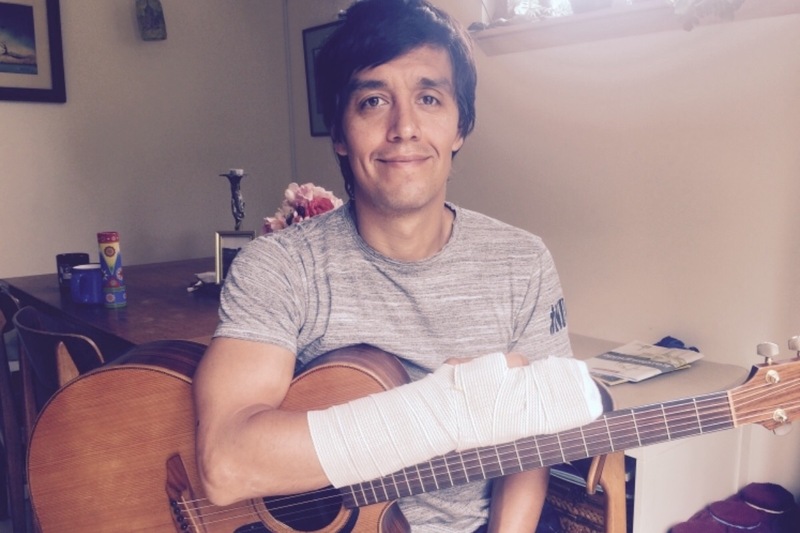 Well, the wonderful news is (as many of you are probably aware) that Simon can play again! He has been performing shows since September. The time he first picked up his guitar to play in late August, and his hands remembered the finger picking patterns, and tunes rang out – was so joyful and amazing. He hand therapist then told him that playing was the best therapy he could do. Since then, Simon has been feeling a renewed joy in making music. His hand, even now, is far from fully healed. He still can barely bend his distal joints (through active effort). 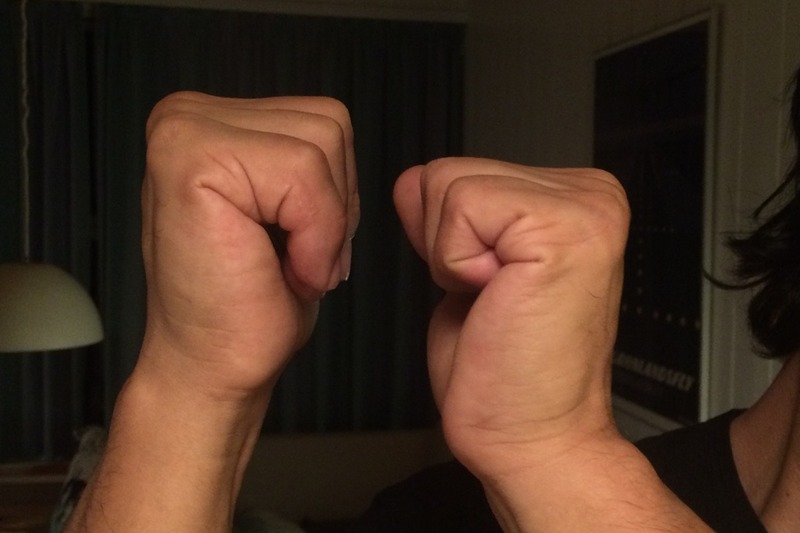 He can't make a true fist, and his fingers are still swollen and thicker than the corresponding fingers on his left hand. There is a lot of scar tissue, and there is still a possibility he will need another surgery to free up adhesions that may be preventing his tendons from gliding as well as they can. It remains to be seen if those adhesions will break free through his own movements, or if he will need surgery. If it is needed, it usually takes place 8-12 months after the first surgery. It would also likely be just as invasive as the first, necessitating another time of healing with a lot of physical therapy. The difference would be, there would be no tendons, nerves or arteries to heal. This experience has also been very psychologically challenging for Simon, and he has been in therapy as well to deal with that aspect of things. It has been a very helpful process. At the time of the surgery in late June, Simon asked his surgeon if he would have to cancel the tour he had booked for September. His doctor said, don't cancel yet. It was just within the time frame that his tendons would be pretty well healed, and we just had to wait and see. We were so grateful that he didn't have to cancel, and that fingerpicking guitar doesn't require the ability to make a full fist! At that time I asked Simon what his November schedule was, and he said he would be in Copenhagen on November 2nd, Greenland mid-November, and then his newest album (recorded in February) was being released on November 23rd (strange detail: Simon had received the offer for a record deal from London based Integrity Records ON the day of the injury, June 20th). So, seeing that he would be away for at least a whole month, and not wanting to be apart that long after such an intense few months, he suggested that we all go as a family. We try to do this every year or two. That also gives me an opportunity to sing with Simon, which is pretty rare for his overseas shows. So, on a whim I checked out tickets for the four of us, and found an astoundingly good deal. We got tickets, rented our house, and are all together in Denmark now on a 6 week trip, playing shows, and seeing family and friends. We'll be going to England and Wales for a few shows next week, and back home in December. Thanks to all of you for your support. It has made all the difference in the world at such an incredibly difficult time. 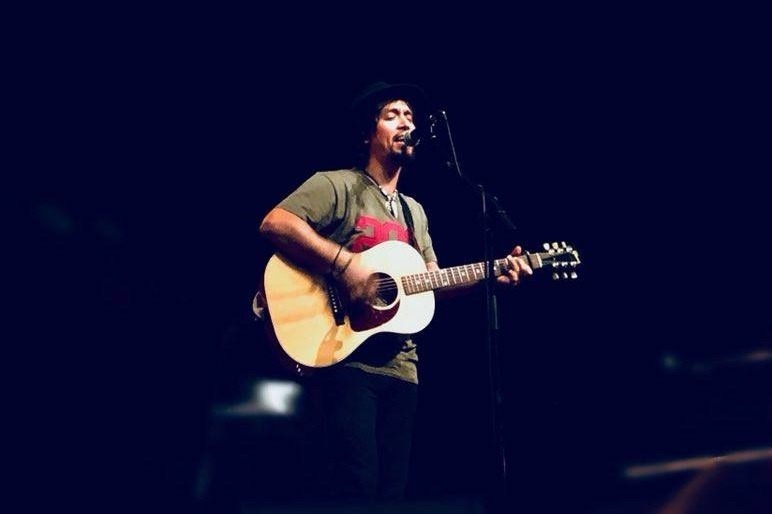 If you want to support Simon in making his incredible music, you can still contribute here as we continue to get back on our feet. We always appreciate your kind thoughts and your caring words. We see great things coming! This week has been really tough. Simon has been experiencing a very odd and problematic issue with the mechanics of his little finger first, and now his ring finger as well. Last week Simon's hand therapist started him on 'place and hold', a movement where he bends his fingers towards his palm passively with his other hand (this is the bulk of the home therapy he's been doing every possible hour of every day since a few days after surgery). He then he tries to hold them in the bent position, to begin to work his flexor muscles. But when he tries to hold, his little finger and ring finger pull back up as if he is extending them (straightening them out). 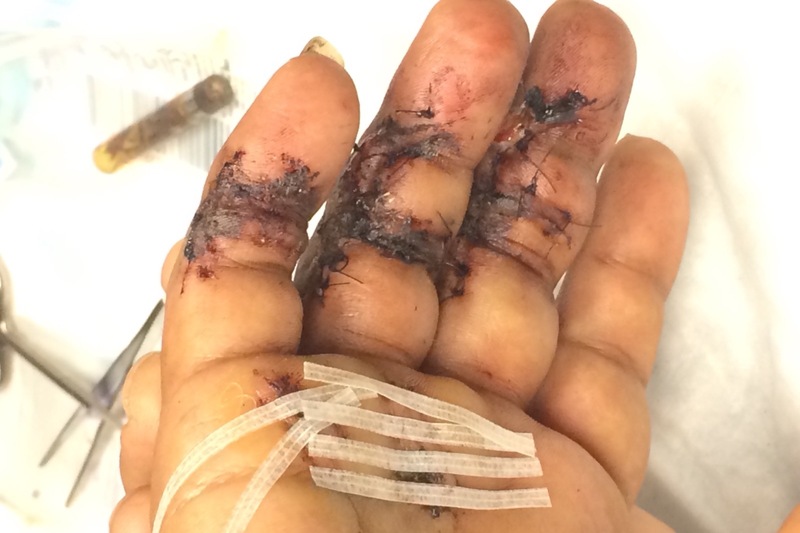 The therapist thought this could be something called Paradoxical Extension, or Lumbrical Plus, a rare occurrence where lumbrical muscles in the palm below the base of the finger adhere to the tendon and cause this reverse reaction. There is a possible surgical solution, but the idea of more surgery is a very heavy thought. We got an appointment to see the PA (physician's assistant) to Simon's surgeon, and went Wednesday to have her take a look. She said she had never seen this, but had heard of it. His hand therapist who has been in that field for 30 years had only seen it once. The PA also thought that this could be caused by the 'bulky' tendon repair – sutures at the repair site, very close to where the tendon moves through one of the pulleys (a ligament that keeps the tendon close to the bone). It is feasible that this bulk is preventing the tendon from moving through smoothly. Basically all of Simon's therapy movements are about preventing the build up of scar tissue around these tiny areas so that motion is still possible. So, it is still unknown what is causing this problem. We are trying to get him in to see the surgeon sooner than 8 weeks from surgery appointment we already have scheduled. The thought of possibly not being able to flex his fingers, even after more healing, has brought Simon back to a state of devastation, and he is feeling quite hopeless at the moment. The magnitude of that possibility is overwhelming with what it would mean for his ability to play guitar and piano as he once did. His career... everything. We have both, this week, listened to recordings of his songs – his incredible, effortless guitar playing, and have broken down in tears at the loss of that. No matter what comes, this IS an enormous loss and deeply devastating, and the state of not knowing is extremely difficult to bear. I've gone back to that night, and the moment when Simon, and then I, realized what had happened to his hand. The horror he and I felt in that moment. The unchangeable event, irreparable devastation. Wishing to just go back 20 seconds. The terrifying loss. There should be a word for such a moment, but I can't find one that is sufficient. I continue to hold hope and a vision of full healing. I am trying to support Simon in holding on to that vision too. It takes time. There is 'what is' – the state of his hand at this moment, which is not bringing him great hope. Then there is the picture we create to move towards. I keep reminding Simon that it is still POSSIBLE for him to regain the use of his hand, to be able to play again. It is not over, and there is much healing still to come. No matter what, he needs to continue the work and the therapy on a regular basis, because it is absolutely vital. If he doesn't, that door to healing will close. Please continue to send your loving thoughts, healing prayers, or whatever form your good energy takes. It is immensely helpful to have so many people lending support. The monetary donations have been a life saver. Without it, we would also be facing financial devastation. I have had to cancel some paying jobs because of all the ways I'm needed at home. But even so, it is Simon's income from touring and his music that is our bread and butter, and what has sustained us. The reality is, we don't know how long this healing will take. We don't know the outcome. Thank you for your continued support. We are extremely grateful. Hi, this is Simon writing. I just want to extend my deep gratitude to everyone who’s donated, it makes such a big difference. 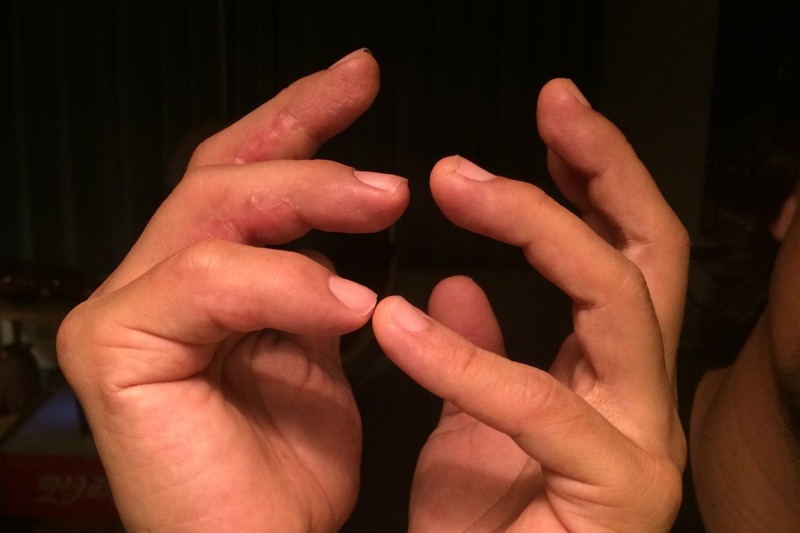 I’ve also been dealing with intense pain in the left side of my body, since that has taken over everything that I normally do with both my hands. This past Friday I had some of the stitches taken out, but some were left in since there was not enough closure of the wounds yet. 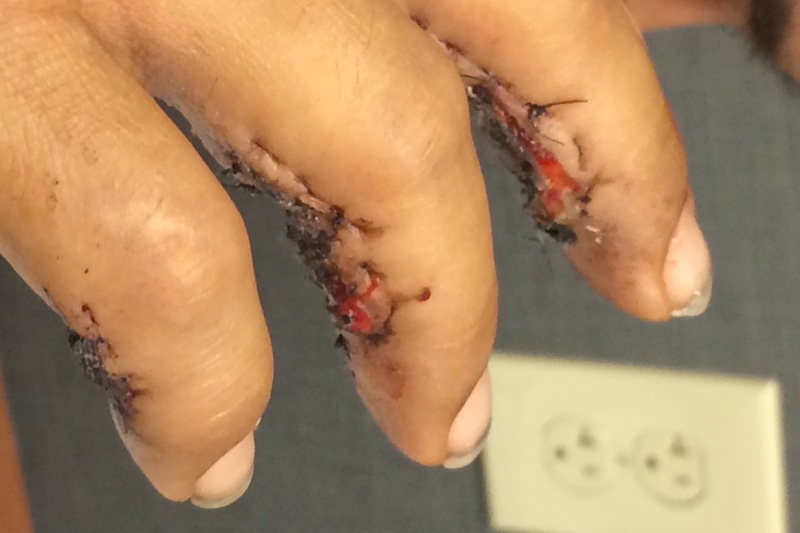 It was the first time I saw my hand since the surgery and it was quite intense, I have attached a couple photos to this update and yes they are graphic, but that is my reality right now and it feels good to share... I hope you don’t mind .